In the Spring framework, autowiring enable you for automatic dependency injection. 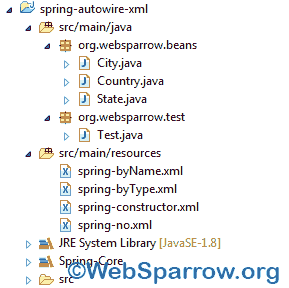 The Spring container can autowire relationship between collaborating beans. To do automatic dependency injection using XML based configuration metadata, you specify autowire mode for a bean definition with the autowire attribute of the <bean/> element. The autowiring functionality has four modes. no no is the default. Bean references must be defined via a ref element. byType Allows a property to be autowired if exactly one bean of the property type exists in the container. If more than one exists, a fatal exception is thrown. If there are no matching beans, nothing happens; the property is not set. It also calls the setter method. byName Autowiring by property name. Spring looks for a bean with the same name as the property that needs to be autowired. It internally calls the setter method. constructor Similar to byType, but applies to constructor arguments. If there is not exactly one bean of the constructor argument type in the container, a fatal error is raised. Note: Autowiring functionality allows you to inject only secondary type’s value, it is not applicable for primitive type’s value. If you apply autowire for any class, it will read all the parameters of the same class. And for that parameter, if there is setter method or constructor, it will treat that parameter as a dependent parameter. Let’s check the complete example of all modes one by one. In my example, I have created two classes Country and State. The Country class has secondary type dependency of State class. To make it more clear, I have divided beans configuration file in multiple parts. If autowire="no", Spring will not inject the values automatically, we need to configure it via ref attribute manually. And the configuration file looks like as given below. If you apply autowire="byType", it will search its dependent type where you applied autowiring. In my example, I have applied autowire on Country class that has the dependency of State class. In this case, Spring container will search its type in all the document and the following configuration works fine. Now the problem is if the configuration file contains more than one eligible object of the same type. In the above configuration, there is an ambiguity problem that means Spring unable to identify which State class object reference pass to Country class and it will throw the exception. To resolve the ambiguity problem, Spring framework will provide one more attribute of <bean/> element i.e. autowire-candidate. By default, its value is true. If you changed its value false, it will not allow the bean to participate in autowiring. And the below configuration works fine. If autowire="byname", Spring container will search reference name along with its type/name. In this case there is no chance to get ambiguity problem because the bean id name should be unique throughout the application. It will throw the Null Pointer Exception if it unable to find the declared reference name. Following configuration works fine. If there is more one object of the same type available, it will work fine because id name must be unique throughout the application. Check this also. To test the autowire="constructor", create another bean City and its parameterized constructor with State reference. Now, as we know that constructor internally will use byType mechanism. The following configuration works fine. Because it internally uses the byType, so there is a chance to get ambiguity problem. It can also resolve by applying autowire-candidate="false". To test the autowiring, create a Test class and load the configuration one by one. You will get the same result on your console log for autowiring no, byName, and byType. And in case of the constructor, you will get the following.